The Allan Cup — Canada’s oldest national hockey trophy — honours over 110 years of champions and in 2019 host town Lacombe, Alberta, our Western Financial Group brokers are part of the story. Men’s AAA hockey is fast — there’s no doubt about it. Excitement is high as the Lacombe Generals, three-time cup champions, enter the 2019 tournament top of the western division. 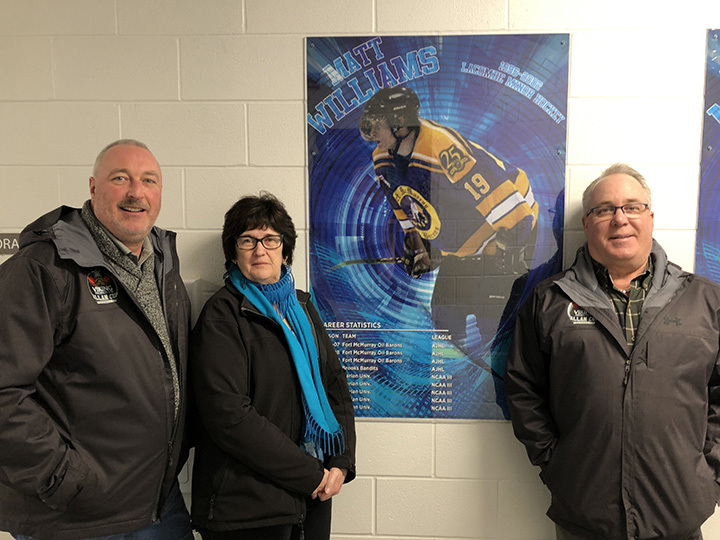 The Western Financial Group team is proud to be a key sponsor of the 2019 Allan Cup, Margaret Williams, branch manager of the Lacombe brokerage, said. “I’m excited to see people (coming) from all over the country,” she said. As a proud Lacombe Generals fan, hockey is her game. Williams said the AAA players put tremendous commitment and skill into the sport. The 2019 Viking Projects Allan Cup occurs at the Gary Moe Auto Group Sportsplex from April 8 to 13. Look for your Western insurance experts at the game on April 11. While the tournament is another chance for residents to meet their insurance experts, an important message shines bright — Western’s Lacombe brokerage supports the town and will always do so. “Western is here, we’re part of the community and we’re not going anywhere,” she said. Steve Christie, host committee chair, said the event showcases Lacombe volunteerism and hockey spirit. “We would not be able to host this event without gracious sponsors, such as Western Financial Group and many others that are helping out in that way,” he said. Excellent hockey players, many whom played in the Western Hockey League (WHL), on European teams and games in the National Hockey League (NHL), compete for the Allan Cup. “These are fellows who just don’t feel they’re finished playing hockey yet,” Christie said, noting players will pull out all the stops to be the number one men’s AAA hockey team in Canada. Two Alberta teams will be joined by others from Saskatchewan, Manitoba, Ontario and New Brunswick, Christie said. Like Williams, he said he’ll be cheering on the hometown team. During his time as mayor of Lacombe, Christie expressed his pride in the town’s hard work spent improving the arena and in transitioning the Bentley Generals to the community. “…To see us hosting the Allan Cup just a few short years after (the Generals) made the move to Lacombe, it’s a feather in the cap,” he said.